"I stroked that Wookiee all the time. I just wanted to give him cuddles"
Right now, John Boyega might be the happiest guy in the universe. He’s 23, he was hand-picked by director JJ Abrams to appear in Star Wars: The Force Awakens, set to be the biggest movie of the decade, and now everyone on Earth wants a piece of him. Dressed to the nines in designer clobber and slumped in a chair in one of London’s swankiest hotels, he grips my hand and grins like a lottery winner. "You know when you sit down with an actor and you ask how they are and they say they’re good?" he bellows. "I’m genuinely good!" 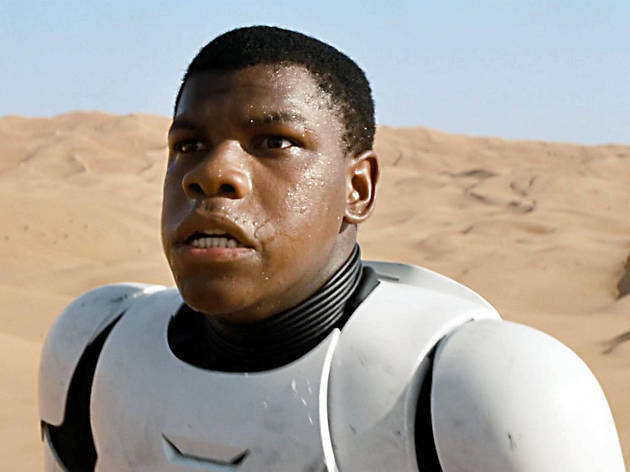 Boyega’s casting as Finn, the footsoldier who deserts his stormtrooper platoon to join the rebel resistance, came as a surprise to almost everyone when it was announced last year. It was followed by a slew of comment pieces, many of them portraying him as a kid from the mean streets, cut from the same guns ’n’ gangs cloth as his character Moses in 2011 alien invasion flick Attack the Block. John, on the set of Star Wars, how many times a day did you find yourself completely geeking out? It was continuous. I get driven to set in the morning and put on my costume, that’s geek-out number one. I get called on set, number two geek-out. JJ [the director] tells me a secret, that’s number three geek-out. JJ gets excited about something, and when JJ gets excited, everyone gets excited: there’s number four. It was like going to Disneyland every single day. How big a Star Wars fan were you when growing up? I was the biggest fan. But I got exposed to the merchandise before the story, the books and the video games. I was born in 1992, don’t judge me! I watched the prequels, then I watched the originals. So technically I did it in order! But I did have a moment watching the original movie, when I was like: Dad, what’s happened to the special effects? What can you say in defence of the Star Wars prequels, the second trilogy that started with The Phantom Menace in 1999? There are a lot of haters. But this is what art is: you release it and let it be judged. Some people don’t like the original films. It’s all a matter of opinion. This one everyone’s going to like, though. By force. What was it like to work with the stars of the original trilogy, with Harrison Ford, Mark Hamill and Carrie Fisher? It was fantastic. It’s all very well me being excited, but they’ve walked this path before so I was intrigued to know how they felt. And all three of them were like: we’re ready to do this. Ready to work, and very professional and fun. Harrison Ford has a daunting reputation. How did you two get along? Ha! I got along fine with Harrison. I get him. Everyone acts up so much in front of him, and he’s just this laidback, down-to-earth guy. If there’s nothing to say, he doesn’t say anything. Did you manage to resist constantly stroking Peter Mayhew when he was wearing the Chewbacca costume? I stroked that wookiee all the time. They had to get me off him sometimes, I just wanted to give him cuddles. Best thing in the world. JJ Abrams made a commitment to using practical special effects. So were you surrounded by rubber aliens and plastic robots? I spent a lot of time at the creature department. Because of my expertise, of course. I wanted to check those guys were making the puppets right! No, it was just fun in there, seeing them putting so much detail into the characters. You’d see the animatronics, weird bat things up in the corner of the roof. It was like a museum. Do you enjoy stunt work? I love all that stuff. It’s like when you’re a kid and you’re playing in the living room, the sofa’s your safe haven and everything else is lava, and you can die instantly if one toe touches the floor. It was like that on an epic scale. How do you think your character, Finn, matches up to the heroes of the original trilogy? I think Finn is frigging cool! With a movie like this, that’s really out there, the audience have to go through this portal of imagination. It’s good to have a character we can relate to. Some characters are part of the magic, they always know what to do, like Batman. Then we have other characters who are like, erm, I’m not sure about this… And I love characters like that. How tough was the casting process? It was hard. And rightfully so. If I bought a company for four billion dollars I’d make sure those actors were on point! [Disney bought Star Wars makers Lucasfilm in 2012.] But it was a great process, it was healthy. 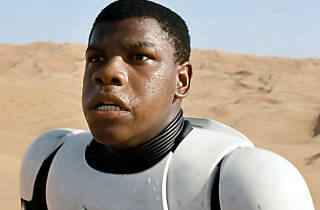 I spent seven months running on a treadmill and saying “Finn” all the time. The only scary thing about it was being on the brink of either being part of history or just going on with life as normal. And that does bring an element of fear, like: Oh my gosh, this could be it. They’re just trying to find a story. When people hear I’m from Peckham they go into this rags to riches mode, this whole escape-the-dark-life thing. That’s why its great to own your own social media, to dismiss it and move on. You tweeted back ‘this isn’t my story’. What is your story? I had a fantastic childhood. I was exposed to a world of contemporary dance, tap, musical theatre. I performed at the Royal Albert Hall when I was 13, I had a great time. Did acting start out as a hobby and gradually become more serious? You hit the nail on the head. I started out so early, it wasn’t a career choice. I was just having fun, expressing myself. But life asks those serious questions, what do you want to pursue? And I chose to do the acting. As a young actor, who were the people doing the things you wanted to do? I always watched movies but I didn’t really see any particular person as a role model. It was more about me! About my skills and my craft. And when I was training, it was about other guys and girls in the class who were better than I was. But when Kidulthood came out, that was cool to see. A number of black British actors have spoken out about the difficulty of finding representation in film or on TV. Were you aware early on that it was going to be a struggle? No, I wasn’t aware of the whole black people struggling for parts thing. I was aware that the black characters didn’t always survive in films, but that was about it! Have you come up against prejudice, whether for your race, your accent or where you’re from? People make stupid comments, but that’s nothing that’s going to stop me! I’m in Star Wars, so they can just sit down and eat that for a second. I feel like people who come from normal backgrounds, we are the massive. I always celebrate Tom Hardy, not because it’s a rags-to-riches story, but because he comes from an area I can relate to. If he can do it, I can do it. Star Wars has always had a strong Brit contingent, but between yourself, Daisy Ridley and Gwendoline Christie, this film feels really London-centric. Is that a source of pride for you? Absolutely. I hope I get to spend a lot of time here when the movie’s released. It’ll be good to be here, to see how people from the UK react to the film. I can’t wait. It’s Christmas as well! Can you imagine ever moving to LA? No. Just… no. London is home, it’s where the heart is. Here is cool. What do you think will change once Star Wars comes out? I think my visits to Tesco’s will be a bit different. But I haven’t been able to walk around Peckham since Attack the Block. It’s nothing epic, not Justin Bieber levels. I can still go to the shops. The other day I took my cat to the vet’s on the Old Kent Road. He had a little swollen eye. You seem very casual about all this. Can you imagine a point where it could get a bit much? There are moments where you’re tired or you just want to hang out with the family, where the force is not always welcome. But you get into a project like this with a full understanding of what the responsibilities are. I’ll wait for the film to come out, for circumstances to dictate how I should go about things, rather than assuming this or that’s going to happen. You can’t control the weather, you can only make a good enough shack. My main fixation is that I get to watch a Star Wars film in the cinema. If you hear someone at the back of the cinema screaming and laughing and crying, it’s probably me. 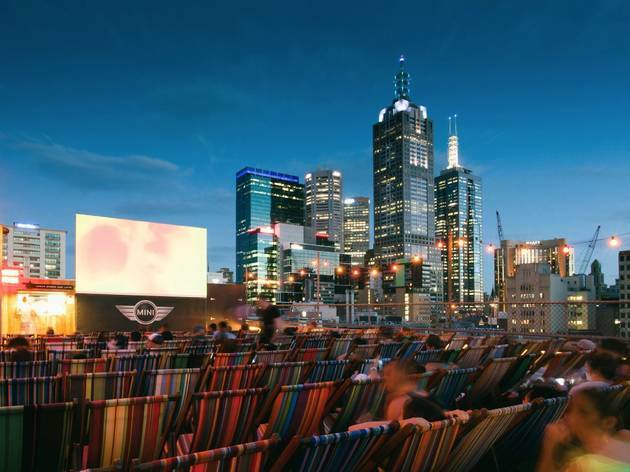 Nice weather means spending warm evenings watching new releases and cult classics; here are our favourite outdoor cinemas.